I suspect most readers of the site will like myself be completely unaware of SHOUEI System even through surprisingly they were a long-established studio. When researching the company, it seems that even in their native Japan the company was considered something of a relatively niche development & publishing label. SHOUEI SYSTEM was initially established on the 8th of May ’81 as the similarly named SHOUEI Co.,Ltd and in November of the following year the company changed its name to the familiar moniker of SHOUEI System Co.,Ltd. While information especially relating to the early period of the company’s is practically non-existent at the time of the company’s Dreamcast development they were known to be based in the Bunkyo-Ku district of Tokyo, Japan. As i’ve already mentioned SHOUEI system’s history proved to be a challenge to research so much so that from the period of their establishment to ’85 i was completely unable to document what the company actually worked on. From ’85 onwards things are slightly clearer as the company became a licensed Nintendo developer and officially started console development for the Nintendo Famicom system. Fortunately, this relationship was a profitable one for both companies as SHOUEI System developed licensed titles based on the popular Toei Animation anime Hokuto no Ken franchise to such an extent that the company continued developing titles based on the franchise for Nintendo’s next generation system the Super Famicom. This resulted in an impressive seven titles across both of Nintendo’s Famicom systems. 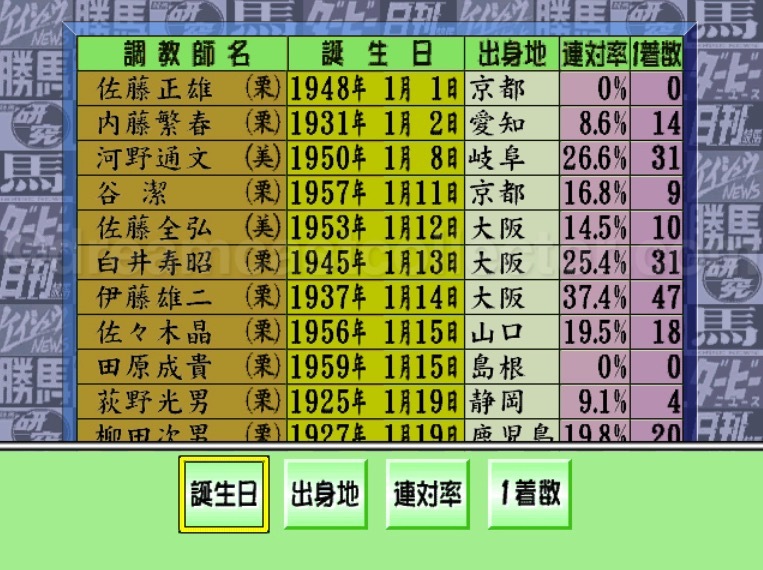 While SHOUEI System could never be considered a prolific publisher after this relatively successful period for SHOUEI System their published output dwindled drastically during the mid to late ’90’s. SHOUEI System’s core business of development and publishing of consumer software for home console systems seemingly stagnated towards the turn of the millennium and the company sought to expand into new markets. The first and closest to their core business model of console development was to expand in to the Japanese home computer market with the Shoumalizer software. This was seemingly somewhat of a successful endeavour for the company and the Shoumalizer software was constantly updated thought ’98-’99. 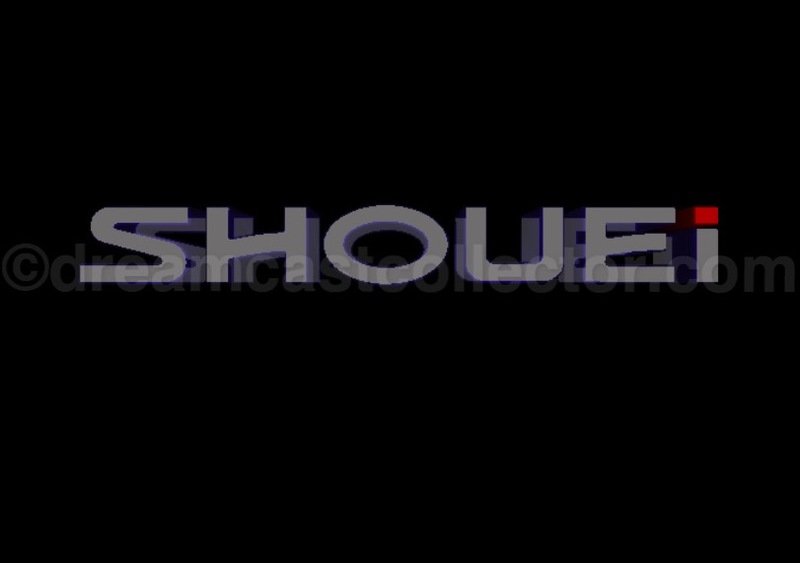 Shoumalizer logo ©1998 SHOUEI System All Rights Reserved. Before i continue on i feel it’d be remiss of me not to disclose that i have no interest or indeed any real knowledge of the sport of Kings or equestrian pursuits in general. My opinion about SHOUEI system & their Shoumalizer Software and more importantly their later Dreamcast title is most definitely from a layman’s perspective. Given that i’ve no actual first-hand experience with their Shoumalizer software & their マイトラックマン simply can’t be really reviewed in the present due to its reliance on its now defunct network infrastructure this article is more an overview rather than a definitive review. Given how little information actually exists for マイトラックマン i hope that this article provides at least some concrete information about their Dreamcast titles either published or unreleased. 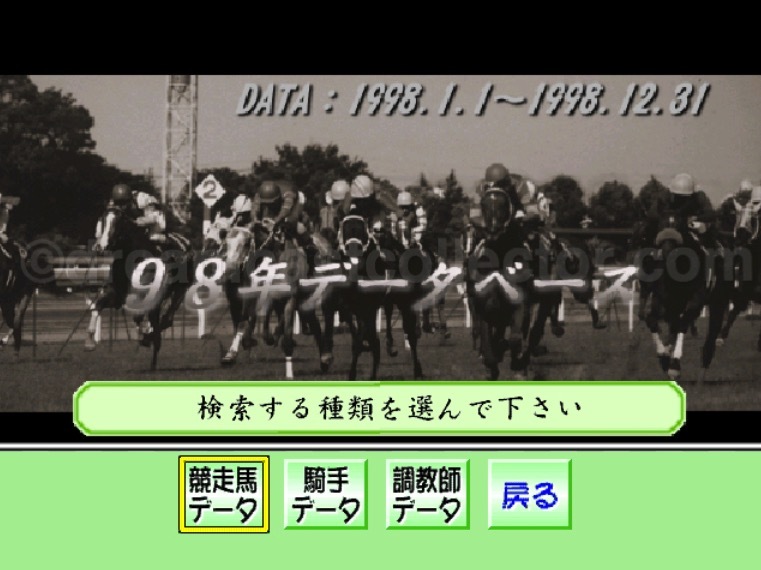 Unlike the majority of their back catalogue which consisted of licensed titles their computer & Dreamcast software went in a completely different direction and both were online enabled horse racing prediction utility software. The Shoumalizer computer software had a subscription fee of ¥300 per day to access the software’s content. You were able to get access to any of that days sanctioned races and get detailed information on all most every aspect relating to the sport from the track, horses & jockeys. 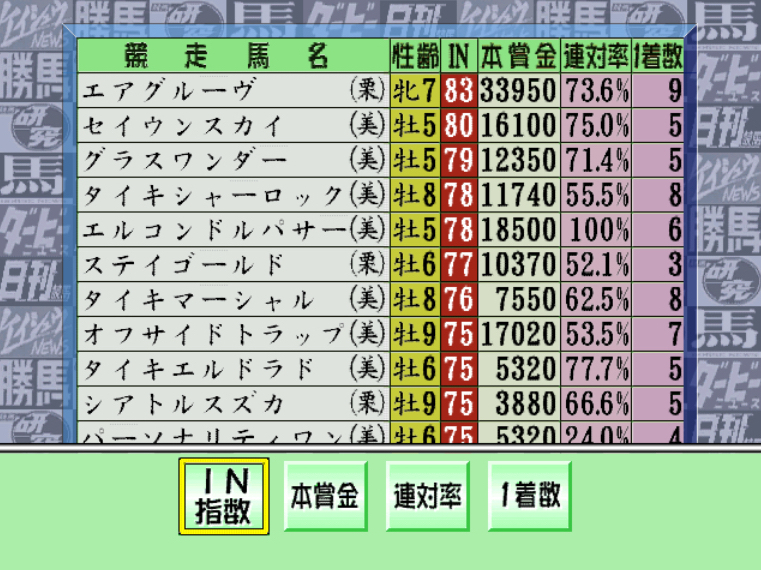 You could then adjust various parameters using information supplied by the JRA (Japan Racing Association). As my knowledge of the sport is lacking the best information would be the archived Shoumalizer software’s official site which i’ve linked to below. © 1999 SHOUEI SYSTEM. Premium Express logo ©1998 Shouei System All Rights Reserved. Not resting on their laurels SHOUEI System also sought to continue to diversify their business interests & designed, developed & distributed an online prize vending business known as Premium Express. This new venture consisted of online enabled terminals which were according to the archived Premium Express website installed in six Pachinko venues around Japan. The Premium Express service provided online prizes that after winning you could swap your winning Pachinko balls for goods online in which you could choose from films & music from the Shizendo chain or games from popular and well-known retailer Softmap. Premium Express store selection screen Shizendo or Softmap © 1998 Shouei System All Rights Reserved. While SHOUEI System’s official homepage has been almost completely archived unfortunately the company seemingly struggled to keep their official site updated especially around the time of their Dreamcast release. Another factor was their catalogue of published works was never updated past the 22nd of July ’98 which was before their Dreamcast titles release. This is somewhat indicative of SHOUEI System’s official website in general as apart from a very basic site for their Dreamcast title their official site makes no other mention of their intended Dreamcast output. Obviously, while SHOUEI System’s financial problems probably weren’t public knowledge the company was in the midst of something resembling an untenable situation during the ’98-’99 period due to their impending bankruptcy. This might possibly be the reason behind the sporadic updates to their official site during this time. 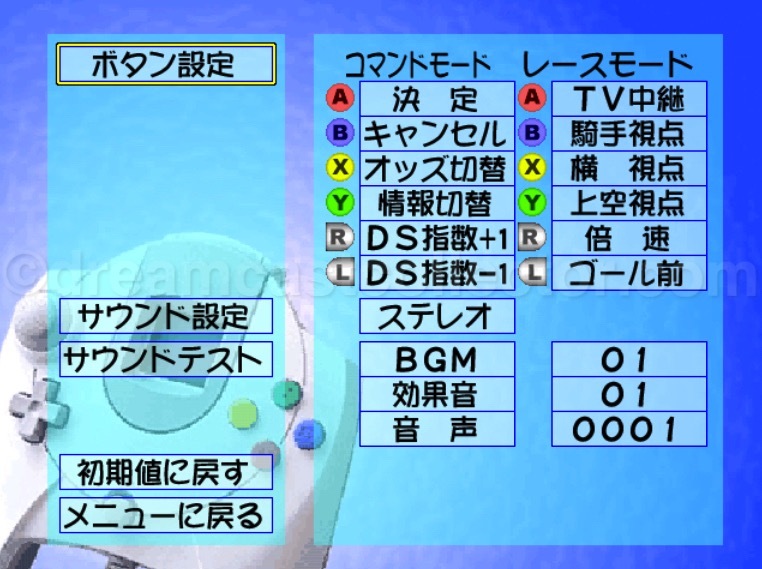 What was officially confirmed through multiple sources including SEGA’s official release list was that SHOUEI System had two known titles in development for the Dreamcast both of which were set to take advantage of the systems online connectivity. Unfortunately, due to SHOUEI Systems subsequent bankruptcy only one of their two intended titles were actually released on the system. Unfortunately, as i’ve previously mentioned while SHOUEI System did have a very basic dedicated site for My TrackMan it’s hardly an exhaustive source of information considering the complexity of their My TrackMan software. To be completely fair to SHOUEI System a website that encompassed the width of information that My TrackMan contained would’ve been a major undertaking for the company. Perhaps SHOUEI System had once planned a more comprehensive site for the game as well as updating their official site in general but the company found itself preoccupied with the financial situation, they found themselves in at the time. SHOUEI System’s archived official My TrackMan site is linked to below and considering the dearth of information for the title it’s at least worth a cursory look. ©1999 SHOUEI SYSTEM ©1999 KANTOU KEIBA SINBUN KYOUKAI. 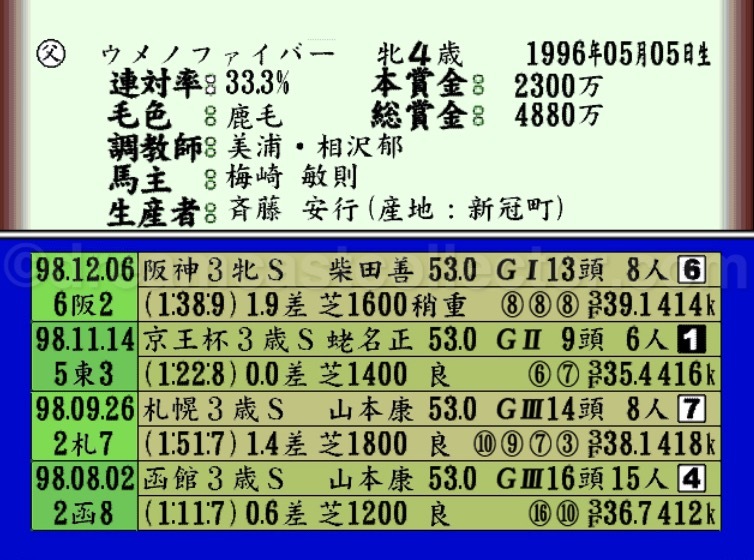 My TrackMan is essentially an online utility which is quite hard to describe as it was effectively a piece of software that allowed access to a dedicated portal which contained archived and updated information provided by the Japan Racing Association more commonly known as the (JRA). You were able to go online and download current data relating to officially sanction races to enable you to predict the outcome of upcoming events. 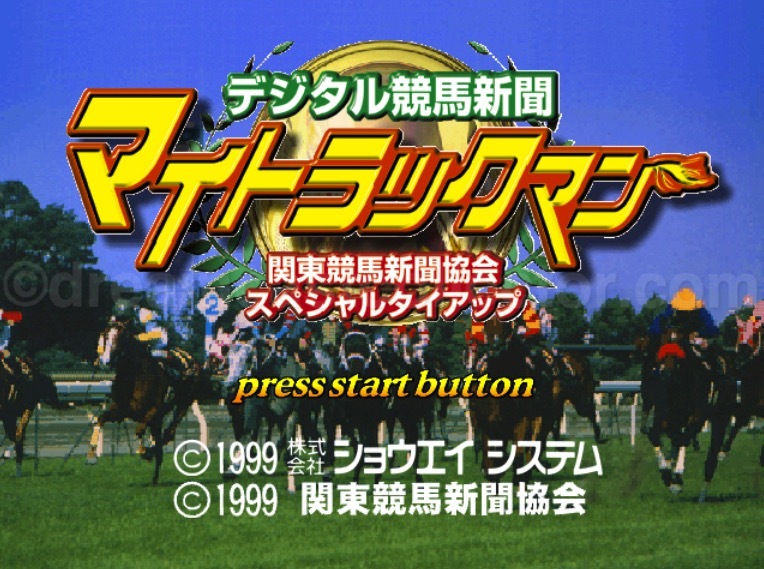 The game was also developed in association with the Kantou Keiba horse racing newspaper association who provided punditry from their experts from a selection of their six in-print horse racing newspapers. 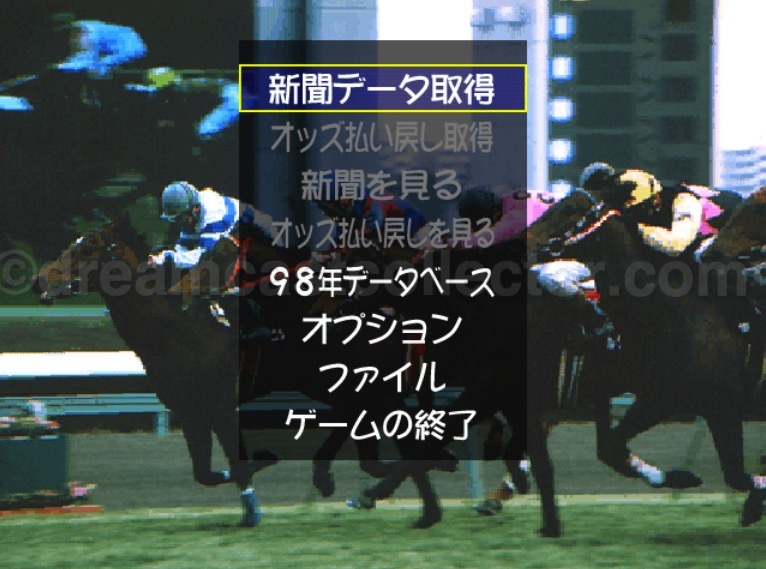 The Kantou Keiba horse racing newspaper associations logo’s feature prominently as background titles throughout the My TrackMan software’s menu screens. I suspect that My TrackMan could be described as being somewhat comparable to a traditional print media racing paper. But being digital the software had a number of enhancements over the traditional physical horse racing media of the time which included eliminating the need to constantly purchase physical print media and their associated cost. The main draw however i’d assume would’ve been the included comprehensive searchable database that provided a wealth of information & statistics on every aspect relating to the sport. This ranged from previous results to detailed information about the Jockeys & the horses themselves from their respective trainer, bloodline & overall performance. All of this was provided by the JRA and available at any time through the My TrackMan software. Again, my lack of understanding about the sport might impact my interpretation of the My TrackMan software but i assume while the prospect of being able to navigate a detailed archive provided by the JRA at any time from the comfort of your own home would’ve been an enticing prospect for proponents of the sport. However, as i understand it the main draw of the software was to be able to simulate races based on statistical analysis of the data that My TrackMan offered which included a high level of customisation to accurately predict upcoming races. 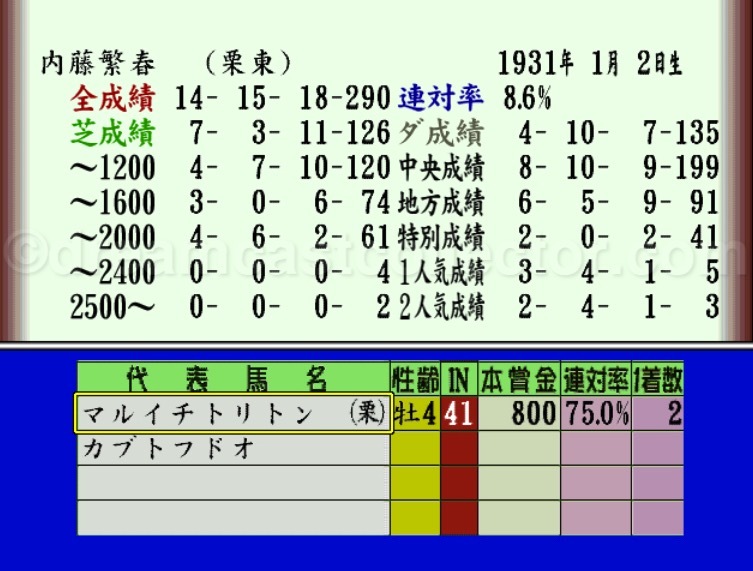 This combined with exclusive punditry on upcoming racing events provided by the Kantou Keiba horse racing association would’ve made My TrackMan quite an impressive package & i’m sure it would’ve been appreciated by racing enthusiasts. 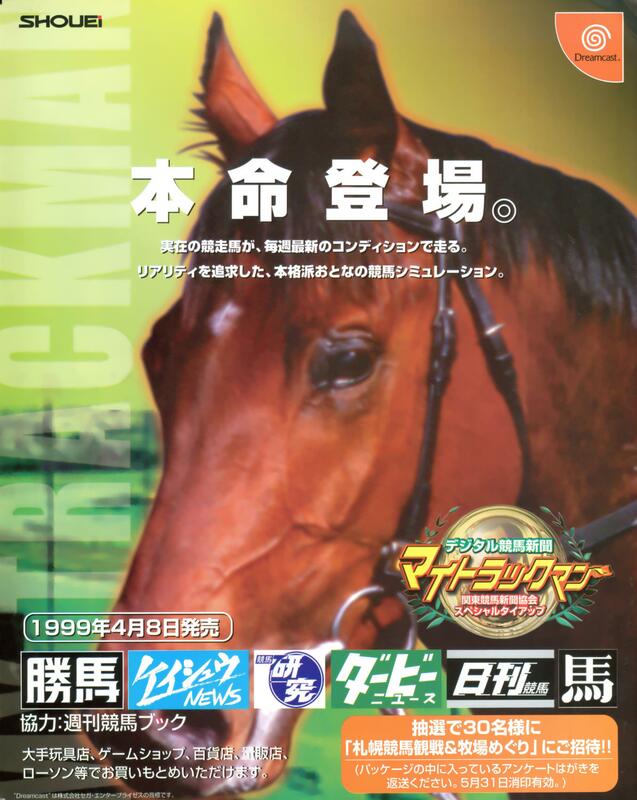 Unfortunately, for SHOUEI System and their My TrackMan software i’ll have to assume while the software offered a number of obvious enhancements over traditional horse racing media the market for such a utility on the Dreamcast was probably in reality exceptionally small. I suspect that the cost to perspective users of both purchasing a Dreamcast system plus the cost of My TrackMan plus the network connection fees & an intended but not implemented subscription fee probably alienated potential buyers due to a high initial outlay to actually use the software. As for SEGA’s traditional Dreamcast audience accounting for something resembling a potential crossover market given the games announced sales figures which were sadly almost non-existent this sadly for SHOUEI System never materialised into a new market for the company. SHOUEI System while obviously confident in their My TrackMan software still needed to promote the title to a wider audience to generate much needed pre-release interest and highlight the exclusive features the My TrackMan software offered. While trying to promote a title such as My Trackman i’d imagine due to the online nature of the software it would create a number of challenging obstacles for SHOUEI System to overcome to publicly showcase exactly what the software entailed. This would have been even more crucial to demonstrate in a first-hand environment given that マイトラックマン has a very basic graphical & audio presentation so it would have to rely on the ease of operation and vast historical data available as well as ability of transferring data to the system. The way that the company chose to address this issue was to organise a My TrackMan event which was held on the 2nd of April ’99 at the prestigious Plaza Equus Shibuya venue. 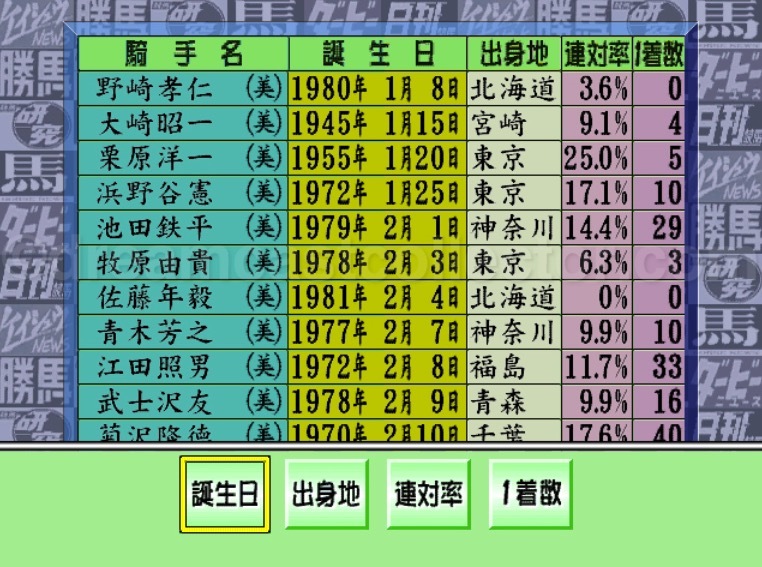 At this event a panel of esteemed racing pundits gave their predictions about the upcoming 阪急杯 race and SHOUEI System used their My TrackMan software to see who could give the most accurate prediction about the upcoming race. SHOUEI System’s My TrackMan appears to have performed admirably proving the software’s credentials. This pre-release event was covered by Gamespot Japan in an online article which has been archived and is linked to below. 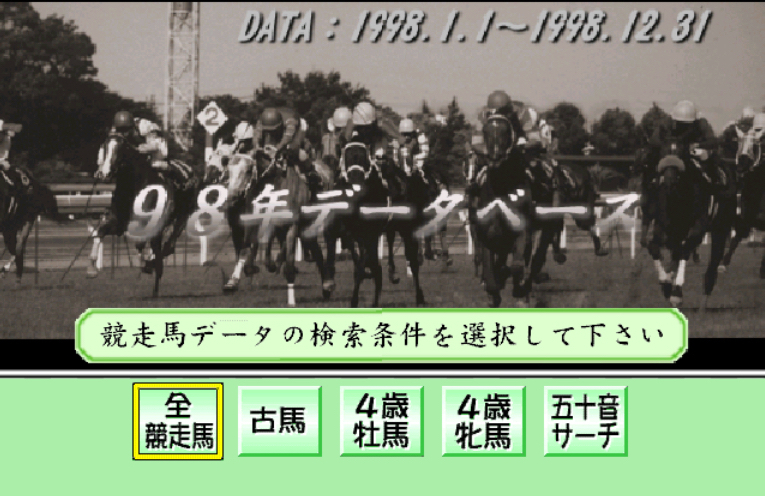 Copyright (c) 1999 by SOFTBANK Corporation. All Rights Reserved. Interestingly this archived article also lists an intended 8th of April ’99 release date for My Trackman which it would eventually miss with the software actually being delayed a further month till May of ’99. While it’s purely speculative on my part i suspect that the dire financial circumstances that SHOUEI System found themselves in undoubtably effected the titles intended release. Unfortunately, a mere six months after the release of their My TrackMan software SHOUEI System in November of ’99 was officially declared bankrupt with debts totalling 800 million yen. 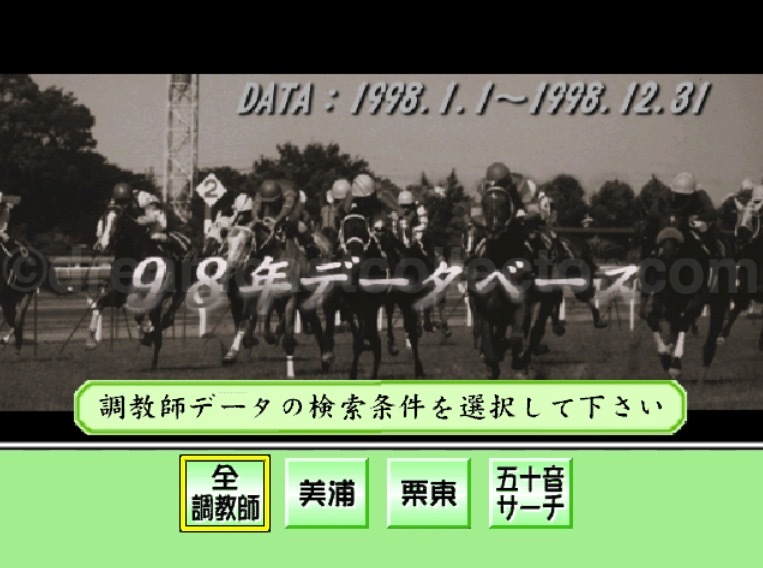 Copyright (c) 1999 by SOFTBANK Corporation. All Rights Reserved. 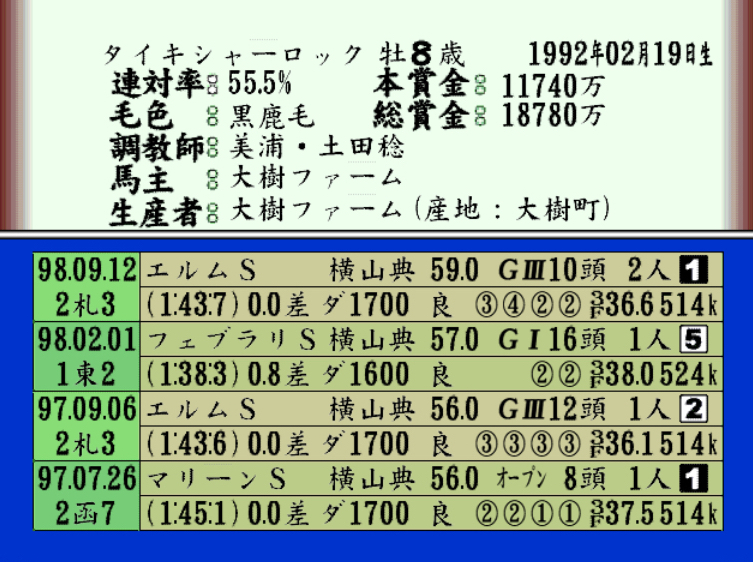 As the company became defunct due to bankruptcy the titles online service was still maintained after the end of SHOUEI System themselves which according to My TrackMan’s archived entry on the SEGA’s Dreamcast catalogue the software’s network service was terminated on the 1st of October ’00. The archived statement is reproduced below. ©1999 SHOUEI SYSTEM ©2000 SEGA. Also, this entry on the Dreamcast catalogue has a strange omission concerning My TrackMan’s technical specifications. The softwares entry erroneously states that My TrackMan doesn’t support any peripheral devices. The software obviously supports the Dreamcast’s analogue modem as well being able to take advantage of the Dreamcast’s VGA adaptor. Given that My TrackMan was an online enabled utility its really quite a strange omission for both SHOUEI System & SEGA to have made on the games official description. One cost that at the time i think many might’ve simply overlooked was the software’s mandatory requirement of 200 VMU blocks to use the software. This is a full standard size VMU unit so My TrackMan basically required its own dedicated VMU which would’ve been an unwelcome additional expense to simply use the software. I’m actually quite intrigued as to how the software’s online service was handled after SHOUEI System’s demise as there appears to be no information about how it was subsequently maintained. Originally the network service was intended to be provided for free with the cost of purchasing the software subsidising the cost than after a year it was planned to have implemented a subscription- based service. 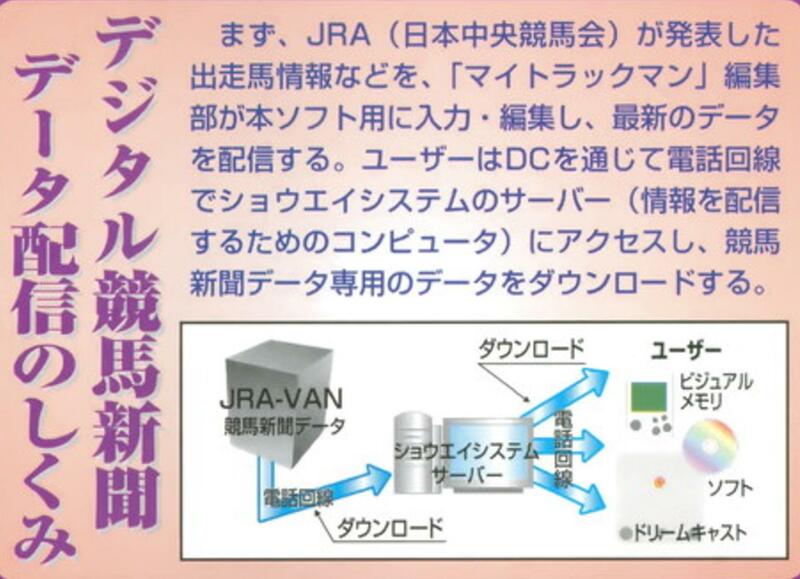 I assume this was to cover the associated licensing costs to both the JRA & the Kantou Keiba racing association as well as general network infrastructure & maintenance. Given that the network operated for a further five months after the intended free period of a year and six months after SHOUEI System themselves ceased operation i wonder who took responsibility for the maintenance of the titles network features. Realistically, i’m sure it was a combination of different parties with the initial period of a year already subsidised i’m sure both the JRA & Kantou Keiba racing association honoured and continued to support My TrackMan. 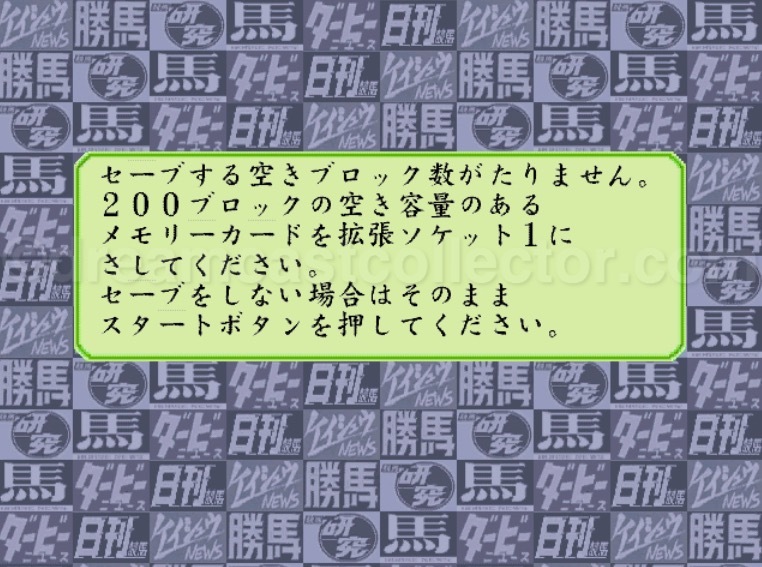 Possibly SEGA might’ve been involved with the responsibility of network maintenance but this is speculative on my part they did however continue to maintain the dedicated dricas site for the game after SHOUEI System’s bankruptcy. Certainly, if the network mode was terminated with the end of SHOUEI System it could’ve caused a backlash from patrons who purchased the software. Currently the My TrackMan software doesn’t have any real purpose due to the software’s reliance on its long since defunct internet functionality to actually access data. The only thing you can do is view various tutorials relating to the features the software offered and browse a restricted library of largely obsolete data. I assume any historical data that you might’ve stored on a VMU could still be accessed but the fact My TrackMan needed 200 blocks or a full VMU probably means that there’s not many that still contain existing data relating to the software as i’m sure they’ve long since been overwritten. To be honest formulating my personal opinion about SHOUEI System’s My TrackMan is a difficult prospect in that realistically as i’ve previously mentioned it’s something of an impossible task given that most of the software’s content can’t be accessed anymore. It can only really be judged on the archived data that is contained on the disc itself which doesn’t do the software any justice as it was simply never meant to have such a restricted amount of data or not be able to connect online. This lead’s on to another issue which i’ve already mentioned and that’s my general apathetic nature towards all aspects of the sport of horse racing. This doesn’t however mean i think it didn’t have some merit just i simply realise that i’m not the titles target market. The only real flaw i can find with SHOUEI System’s title is the lengthy loading times which considering the amount of searchable data provided it’s perhaps isn’t all that surprising. The only other issue relates to My TrackMan’s music which is extremely limited and personally i find it strangely upbeat considering the genre of the software. While i can’t definitively state i believe they are actually simple MIDI tracks but i’ll leave it to people more knowledgeable than myself to confirm my suspicions. I suppose that given users were used to simply reading specialised print media basic inoffensive music as featured in My Trackman would be a welcome addition. From a game on the Dreamcast you could class it as basic at best but My Trackman isn’t a game but more a dedicated piece of utility software so it’s somewhat unfair to compare it to the systems traditional game library. To give My TrackMan credit it’s a very comprehensive & specialised piece of software that even a layman like myself can see by glancing over the encyclopedic content it offered. I can completely understand how enthusiasts would’ve appreciated the depth of the information it provided by the JRA from the comfort of their own homes. The remaining content accessible on the disc would presently only be useful for historical information which it would be definitely more convenient & easier to simply to use google to search for the information. Even if you were a horse racing enthusiast its simply impossible to accurately assess the service provided by the software due to its reliance on its defunct online connectivity. SHOUEI System’s My Trackman software was well reviewed in contemporary Dreamcast periodicals of the time so that might inform you of the software’s standing in the systems catalogue. SHOUEI System had another title in development which proceeded My TrackMan’s development by some margin. Warrz had a particularly protracted development with the game originally being developed for SEGA’s previous system the SEGA Saturn. It was set to be an intensive massive multiplayer online title & it would’ve been a late release title on the system probably sometime in late ’98. Obviously SHOUEI System realised the dwindling Saturn market wasn’t an ideal platform to continue development for so late in its commercial lifespan & SEGA’s upcoming Dreamcast with its in-built online connectivity represented a much better prospect for Warrz’s release. The reason why Warrz never saw a release is simply i suspect due to SHOUEI Systems impending bankruptcy. I imagine that development was realistically suspended in early ’99 if not even before. With continual subsequent delays to My TrackMan and the impending financial crisis the company found itself in probably meant that they diverted all available resources to ensuring My TrackMan was actually released. 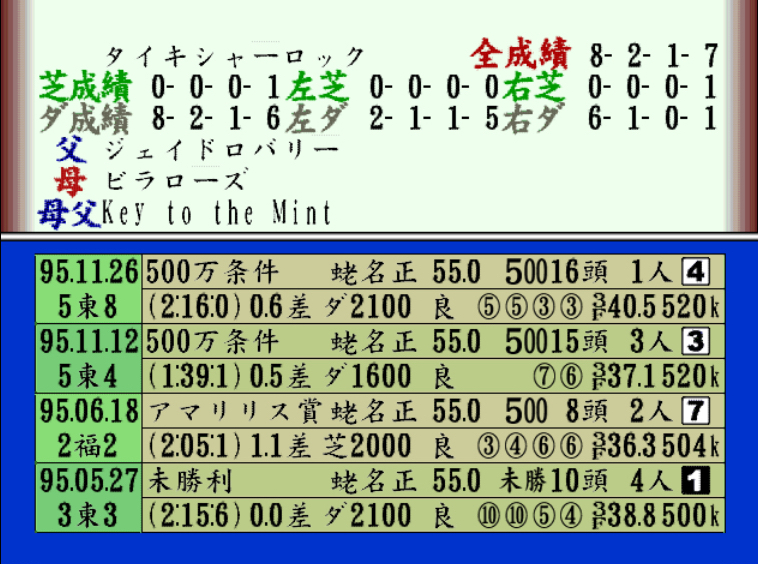 The reason behind this decision was probably the licensing agreements already in place with both the JRA & Kantou Keiba racing association that meant that My TrackMan took priority over Warrz. This is all completely speculative on my part but personally, i think it makes the most sense but if anyone can provide any officially confirmed information about the game that either supports or disproves my theory please get in contact. Personally, i think Warrz actually seemed the most commercial title of the two that SHOUEI System had in development for the Dreamcast but it simply wasn’t to be. I’m quite convinced that had the company managed to negotiate their way out of the dire financial situation they found themselves in Warrz would been released probably sometime in late ’00 and would’ve had the catalogue code of T-37002M. They clearly had a workable version of the game available at the Tokyo Game Show ’99 and the company clearly had no issues with the Dreamcast’s online infrastructure. I assume with the cost of launching a massive online multiplayer title probably put any potential licensees of finishing development or publishing the title. I’ve never come across any individual Not for Sale disc for My TrackMan and even through other online only titles have received an unexpected Not for Sale disc i personally, think that due to the limited promotional opportunities and probable lack of marketing budget at SHOUEI System one wouldn’t exist. I’ve also never encountered any other type official media relating to the game at all except from the in-print media in various trade magazines i don’t think anything else was sadly distributed in support of My Trackman. Again, due to the dire financial situation SHOUEI System found themselves in i very much doubt there was much pre or post release support for their title. As for SHOUEI System’s other intended Dreamcast title Warrz outside of the development environment i sincerely doubt anything exists. Possibly their might have been printed matter relating to the game at the TGS where it was showcased at but i’m not currently aware of any media for the game existing in private hands.